7. DVD Won't Play? - Solved Here! Sometimes it can be challenging to play DVD in your computer, especially if your computer lacks the required hardware. You insert your DVD on your computer and nothing takes place. The next thing is to open your media player and nothing happens. Then you are wondering what’s going on with my discs or my computer. However, it can be easy to play the DVD in your computer once you have fullfilled the necessary requirements. Then again, you must be wondering what requirements must be fulfilled in order to play DVD with a lot of ease on your computer. It is worth mentioning that a CD drive can never play a DVD. Therefore, it is important to ensure that your computer meets the following requirements in order to play DVD on Windows 8 or Mac. Sometimes playing your DVD in Windows based computer, including Windows 8 can be a bit challenging. As mentioned before the trick is just the same in order to play DVD on windows 8. What makes it different with Windows based computers is that the most relied on the media player in this case Windows Media Player cannot play your DVD. Then you end up wondering what the problem with your computer is. The answer, fundamentally, is that Windows 8 is not capable of playing DVDs simply because the software technology for playing DVDs is not free therefore you just have to purchase it. Therefore, what can Windows based computer user do to play DVDs on computer with a lot of ease. There are a number of options that can be used to play DVD on Windows 8, 7 and XP. Then again, before embarking on the options it is important to ensure that your computer meets the needed requirements which include Windows Operating system, DVD decoder, DVD-ROM drive and lastly Media player(Windows Media Player 10 or a third-party software DVD player. Microsoft has announced that DVD playback will not be available by default in Windows 8 with its Windows Media Player.If you want to play DVD in Windows 8, you have to pay Microsoft by upgrading their copy of Windows 8 to include Windows Media Center or turn to third-party DVD players. Here three ways to play DVD movies in Windows 8 effortlessly are introduced. The most convenient way to play DVD movies and videos in Windows 8 is to convert DVD to Windows 8 friendly video formats like AVI, WMV, etc. To do this, a DVD ripping program is needed. Here Aimersoft DVD Ripper Software is highly recommended to help you get the work done with ease. With it, you can rip both homemade and commercial protected DVD movies to virtually any regular video formats like AVI, WMV, MKV, FLV, MP4, MOV, 3GP, VOB, etc. 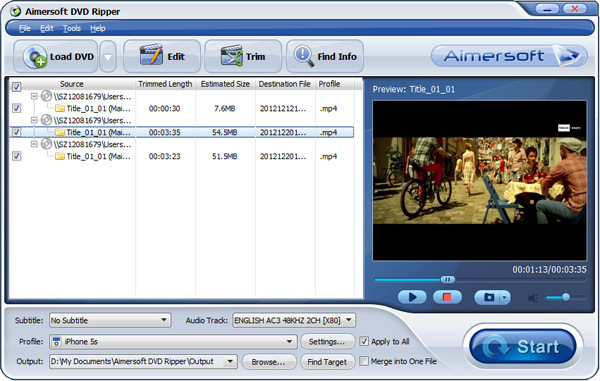 The main interface of Aimersoft DVD Ripper is as below. As you can see, you can finish your work in three simple steps. Step 1. Insert the DVD disc into your DVD drive and click Load DVD to import the DVD movie for ripping. Step 2. Click Profile to select a proper output video format. Besides common video formats, you can also select a device like iPhone, iPad, iPod, Zune, PSP, Xbox 360, etc. as the output format to get videos with optimized settings for a certain device. Step 3. Click the Start button when all settings are OK. Wait for the conversion to be done. After the conversion, you can play your DVD movies with Windows Media Player or any other media player as you like. There are also some open source free media players that can play DVD files in Windows 8. The best one is VLC Media Player, which well supports playing DVD, AVI, MKV, MP4, ASF, 3GP, etc. Another good free DVD player for Windows 8 is Mplayer. It can not only play DVDs but also encrypted Blu-ray movies. You can also upgrade your PC to get Media Center in Windows 8 to play DVD movies. Basic Windows 8 users can purchase the "Windows 8 Pro Pack" to upgrade to Windows 8 Pro with Media Center. And Windows 8 Pro users need to purchase the "Windows 8 Media Center Pack" to enable the DVD playback. All in all, converting DVD movies to videos in Windows 8 is the best way to play your DVD movies anywhere you like. If your computer is running Windows 7 Home Basic or Windows 7 Starter then you have two options. First, you can upgrade your operating system to Windows 7 Home Premium, Ultimate, or Enterprise, which are enabled with a full DVD capability. This way you will be able to play your DVDs using Windows media player. The second option is to purchase a complete DVD player or install a free third-party software DVD player. If your computer has Windows Vista Home Basic, Enterprise, or Business, or any edition of Windows XP, you can check on the plug-in and add-ons related to Windows media player that are available for purchase. After which you will to buy a compatible DVD decoder in case you do not have one. Lastly, you can always opt for a third-party software DVD player in order to play DVD on computer. IMac and MacBook Pro are a range of all-in-one Macintosh desktop and laptop computer that are considered one of the most renowned computers in the world today, released by Apple Inc. As mentioned before, for Mac play DVD it requires hardware, fortunately all Mac comes readily equipped for the service. 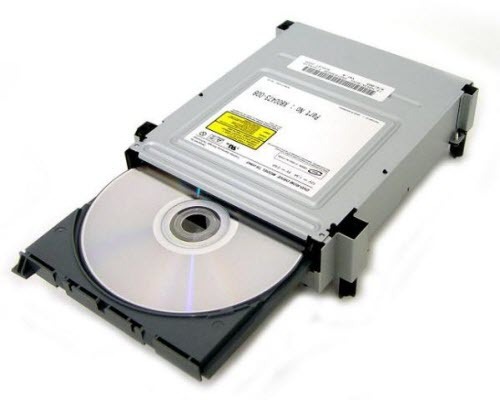 In order to play a DVD, you will either need an external or internal DVD drive compatible with your computer. On the hand, you must have a FireWire or a USB 2.0 connection, especially if you are using external DVD. The DVD Player application in Mac comes with onscreen controllers that enable you to play your DVD with a lot of ease. Sometimes when you insert your DVD in your Mac, it plays automatically unless you selected not to in the system preferences. If it fails to start on its own here are the steps that you can use to play your DVD on Mac. Insert your DVD in the external or internal DVD drive, which should automatically launch. If it fails to launch automatically go to the application folder where you should be able to view the DVD icon and double click to initiate the process. On the other hand, you can single-click the DVD icon on the launch pad to start it. You can also use the Front Row to play DVDs by launching it with the menu button or by holding Command (apple key) along with the esc key at the same time. When your DVD fails to play by default, especially when you have met the requirements, then the problem is in the preference. The only way to rectify this problem is to change the preferences. If you want to change, the preferences so that the DVD can play automatically when inserted on Your DVD player follow the following steps. If you have fulfilled the required conditions and changed the preference in your System Preferences, the DVD will always play automatically whenever you insert it in your Mac. Since DVDs are not supported by some media players, for example iTunes, QuickTime, etc. If you want to play DVD on Mac with any media player with ease, you can rip the DVD to popular video formats that are supported by any media player with a Mac DVD Ripper. 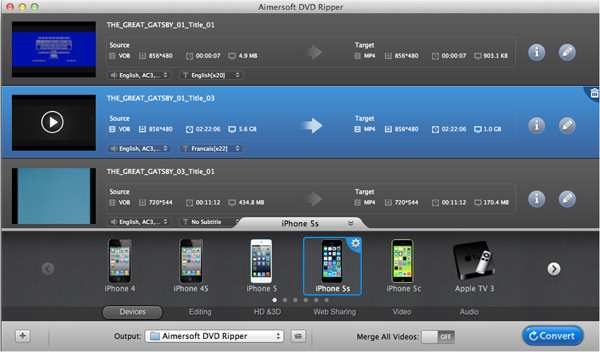 Aimersoft DVD Ripper for Mac can help you rip DVD to any regular video and audio format, such as AVI, WMV, MKV, MOV, FLV, MP4, MP3, WMA, AAC, OGG, etc. so that you can play the DVD anywhere you like. It also serves as a player to play DVD on computer. After the DVD files is loaded, you can view the DVD movies and take snapshots as you like. After the conversion, you can transfer the movies to portable devices like iPhone, iPad, iPod, etc. and enjoy the movies on the go! Here the DVD converter Mac can be used both as a DVD player and DVD ripping tool. You can play DVD movies on it or convert DVD to other video formats, such as MOV for QuickTime Player. If you want to watch DVD movies with it, all you need is inserting DVD to your Mac, then drag and drop the DVD icons on the desktop to the application. You can also use it to convert DVD to fit with your player on Mac. Here are the steps for how to use it. Drag and drop DVD icons which has appeared on the desktop to the app. Or you can go to "File" > "Load DVD". Now you can choose Mac-compatible format, say MOV or MP4, as the output format for the target videos in the format drop-down list. If you want to watch these videos on devices, like New iPad or iPhone 5, regularly, you can choose the corresponding devices as the output video format. What's more, if you select one of Apple Devices as the output format, the output files could be imported to iTunes automatically after the video conversion. Press the "Start" button on the main interface to accomplish the video conversion. After the video conversion, you can freely play DVD videos on Mac. See, you can accomplish this task as easy as turning your hands over. Why not download the DVD ripping program for Mac right now? Hi, that's probably because you tick the auto-playback option when burning DVD.